As a conspired collaboration, this release gathers only a few sound artists and their projects. 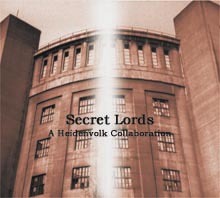 "Secret Lords" is on hidden life of buildings, on fate petrified in stone, and on history conserved in architecture. The songs describe the monumental elevation of buildings, seize their sound and play with light, and nevertheless reflect the fate of people. The CD is delivered in a noble digipack with 12pages booklet.